Diet is not an easy thing to do. It requires commitment, focus, and willpower. Many people have failed on their diet and don’t know why it happens. All the routines are followed accordingly, all the food plans are also executed, but the weight still doesn’t go lower. If you are one of those people, you will find the reason why you can’t seem to lose weight and also the possible solution to overcome the problems. 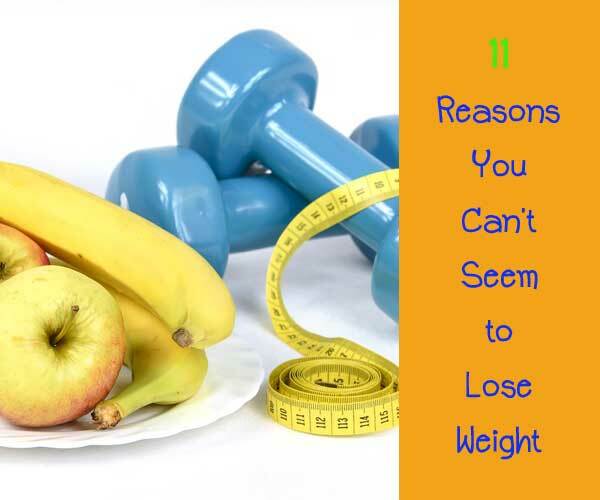 Here are some reason why you can’t seem to lose weight and also I provide the possible solution to overcome to the problems. Stress can make your body produces cortisol excessively; the excess of cortisol is translated by your body as a scarcity of food. The body then responds it by storing fat, slowing down metabolism process and makes you eat more. You need to avoid stress in order to lose some weight. If you think you are stressed, a possible solution is to practice yoga or meditation and take a vacation more often. Coffee is everyone’s favorite, almost all people drink it. Coffee contains caffeine that can raise the production of adrenalin which resulted in high blood sugars level. If you are just sitting around all days, the unused blood sugars will end up stored as fat. The solution is just to drink green tea instead, it is way healthier. The theory is to stoke up your metabolism, but in practice, there’s evidence that this doesn’t work. When researchers at Australia’s Newcastle University tested it, the book didn’t work for weight loss. A possible solution is to eat only when you’re hungry but not in a very big portion. Eating when you don’t feel like it and just because the book told you is an awful diet wrecker. We need at least 30 different kinds of food every week in order to get all the nutrients needed, according to a study conducted by weight loss researcher at Sydney’s Garvan Institute, your diet is not working properly in just one nutrient, your body will make you eat more until you meet the need. The solution is to find a new recipe book and make sure you get a good combination of proteins, vitamins, minerals, and fat by eating a more vary foods combination. Fatty, low-nutrient junk foods can change your brain in a similar way to the drug affected people. If you still think you need a cheeseburger to feel normal, that’s the problem. The solution is simple, eat nutritionally, you will soon stop craving the junk foods. Working in front of the computer all day is not good. Sitting all day with a near zero movement of your body can speed the storage of fat in your body. The solution is obvious; get up from your chair, pace around, do stretching, and walk over and talk to people in the office. Diet does not mean an absence of fat; your body still needs fat. Carbohydrate takes around 20 minutes to be processed by the brain to signal we’ve eaten. When the signal comes, we might have eaten too much. Fat and protein, on the other hand, make the center of the brain starts signaling within five minutes and you will feel full quickly. The solution is to put oily dressings on the salad and add lean meats, fish, and eggs to your diet or you can try diet coke chicken chinese 5 spice. You can blame your parents this time. According to researchers, people with certain variations of the “fat and obesity-associated gene” have a larger desire to eat and will get fatter easily than those without. There’s no perfect solution for this problem. You can exercise routinely and eat healthier foods to lessen the influence of the fat genes. Some of the prescription drugs can cause weight gain because of their effect on your appetite and metabolism process. The prescription drugs that may cause this are the new generation of corticosteroids, antidepressants, and blood pressure medications, according to a WHO research. You can solve this by consulting your doctor if the effects seem to be out of hand, or you can simply ask for the alternatives to the medication. Calcium is playing an important role in weight loss, according to a researcher. Eating a sufficient amount of calcium appears to lower the desire to eat excessively and on the contrary, not eating enough seems to increase appetite. So the solution is to include low-fat dairy products in your daily diet to meet a sufficient calcium intake. A research that includes 68,000 women found that the less sleep a woman got, the more likely she was to become obese. Lack of sleep affects some hormones. A nutritionist once says, the rise of cortisol and ghrelin levels makes you hungry and stores fat, while leptin, the satiety hormone, lower. So, get seven to eight hours of sleep every night. Then, check yourself which part is the main reason that make you can’t lose weight, fix it and you will be on the way win. Hopefully this short article could solve your mystery problems in losing that you can’t seem to lose weight.